Paper Plane. . HD Wallpaper and background images in the Rin und Len Kagamine club tagged: rin plane paper len kagamine vocaloid. it make me cry too! wah! i cry when i hear the song! all vocaloid songs are so heartrending! I listened to the song after seeing this. I was sad. Regret message: Crying for a minute. Servant of evil: Crying for a few minutes. That song was soo sad... beautiful, but sad. 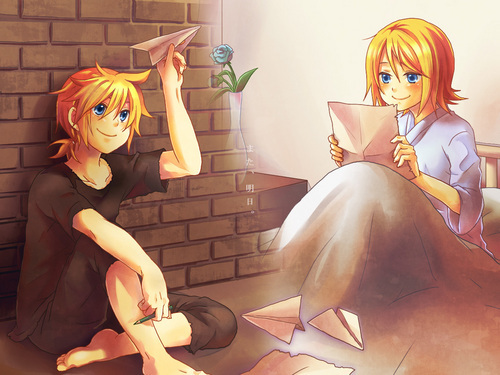 Paper Plane made me cry 4 1 hour. Rin & Len r my favorite. But if Rin & Len have died several times, I think its just for the video/song so for me they are still alive.